Learning how to pick locks is surprisingly easy. Becoming proficient at picking locks takes practice. Like driving a car or playing a sport, having the knowledge of how locks are picked is just the start. Only through practice can you gain skill. The easiest way to learn how to pick locks is to start with a lock that only has one or two pin stacks in the cylinder. After you have picked a one or two pin cylinder a few times you can quickly progress to more pin stacks. Attempting to pick a lock for the first time with full cylinder is possible but learning will progress much faster with fewer pins. Remove all pins from your cylinder except the first two pin stacks closest to the key hole end of the cylinder. Follow the directions below to learn how to pick locks. Picking a lock is done by manipulating the locking mechanisms inside the lock. The first step in learning to pick locks is to understand how a lock works. A pin tumbler lock consists of a cylinder housing, the plug (the part you insert the key into) and a series of pins. Each pin stack (one stack of pins) contains a bottom pin, a top pin, and a spring (not shown) above the pins to press the pins down. A very important concept in learning to pick locks is known as the “shear line”. 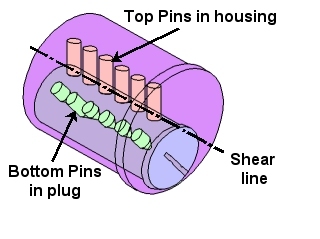 The shear line is the imaginary line where the pins pass from the plug into the housing. In fact, this is why a lock cylinder can’t turn without a key. The pins pass through this shear line and “pin” the plug to the housing preventing it from turning. When the proper key is inserted, the cut side of the key lifts each pin stack so that the break between the bottom and top pin lines up exactly at the shear line. With the pin breaks lined up at the shear line, the bottom pins are all in the plug and the top pins are all in the cylinder housing and the lock is free to turn. In order to pick a lock, we have to raise each of the pins to the shear line and turn the plug as if we had a key. The trick is to keep each pin at the shear line while we raise the next pin to the shear line. Thanks to tiny errors in lock manufacturing, this is not as difficult as it seems. Manufacturing tolerances and keeping the pins at the shear line. No manufacturing machinery is perfect. The machinery that is used to mass produce lock cylinders is usually very accurate but small manufacturing variations still exist. When the row of holes for pin stacks is drilled in the plug, each hole is slightly different from every other hole in the plug. The differences may only be a few thousandths of an inch but this is enough to make it possible to pick locks. As you can see from the exaggerated drawing above, every hole drilled in the plug is slightly to the left or right of the true center line. Again, these errors may be only a few thousandths of an inch and are too small to see with the eye but they are still large enough to make lock picking possible. Because of these manufacturing tolerances, one pin stack will be farther from the plug’s true center line than all of the other pin stacks. 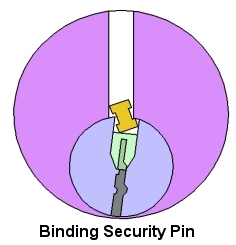 Often the most off-center pin stack is the first or last pin stack in a cylinder but it can be any of the pin stacks in the lock. The pin stack that is the farthest off-center will end up being the pin that does most of the work in preventing the plug from turning. If we attempt to turn the plug without first inserting the key, the pin stack that is the farthest from the center line will become jammed between the plug and housing before any of the other pins. We call this pin the “binding” pin. We’re now at the point where we’re ready to start picking a lock. Let’s review the important points first. 1. To pick a lock we have to lift the pins to the shear line. 2. Because lock manufacturing machinery is not perfect, the pin stack holes that are drilled in the lock plug will not be perfectly along the centerline of the plug. 3. The pin stack that is the farthest out of line will bind if we attempt to turn the plug without a key. We call this pin the “binding pin”. The first step learning how to pick locks is to place a slight turning force or torque on the plug. Normally we would apply this turning force with the key. 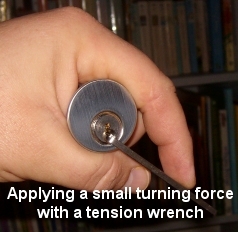 When picking a lock, we apply this turning force with a tool called a tension wrench. Different types of tension wrenches are available but the most basic and most common tension wrench is a small bent piece of flat steel. The bent end is stuck into the plug’s key way and light finger pressure is used to apply a small turning force to the plug. When we apply a turning force to the plug, we cause the binding pin to bind the plug and housing together and prevent the plug from turning. The second step in picking a lock is to find this binding pin and lift it to the shear line. Insert a pick into the lock cylinder. While applying a light turning force to the cylinder, carefully probe for each pin and lift each one. Most of the pins will lift easily and you will be able to feel the spring pressure against the pins which will push the pins back down as you let each pin stack back down. One pin stack will not lift easily. This pin stack will feel rigidly held in place. This will be the binding pin. If you relax your turning force on the plug, this pin stack will be released and the pins can be pushed up against spring pressure just like the rest of the pin stacks. But we don’t want to relax the turning force. We need this pin stack to bind. Lift the binding pin stack. It will take some gentle force to get it to move. The amount of turning force on the plug is important. Too much turning force and it will be too difficult to lift the binding pin stack. It’s hard to explain the proper turning force and different locks may require slightly different turning forces but the rule of thumb should be light pressure. You should be able to lift the binding pin stack without any possibility of bending or breaking a lock pick. Raise the binding pin stack slowly and pay attention to what you feel and hear. When the binding pin reaches the shear line, the cylinder plug will turn slightly. The turning is almost imperceptible. You may feel a tiny click through your tension wrench as the plug turns a tiny fraction of a degree. This is the sound and feeling of the first pin stack being picked. When the plug turns this tiny fraction of a degree, the pin stack’s top pin will be trapped in the cylinder housing with just the very corner of the top pin resting on top of the cylinder plug. If you were to relax your turning force at this point, you would hear a definite click as the top pin slipped off of its thin ledge and was forced down by the spring above the pin stack. 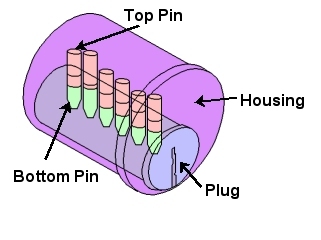 An exaggerated sketch of the top pin resting on the cylinder plug is shown below. Now that the first pin has been picked, the pin stack that was the second farthest from the center line will become the binding pin stack. You will need to take your pick and probe each pin in the lock to find the new binding pin. If you’ve pinned your lock with only two pin stacks as suggested, this should be a fairly easy thing to find. When the second binding pin is found, lift it slowly until it too reaches the shear line and the plug turns another tiny fraction of a degree. Lift slowly and listen and feel for a tiny click as the stack reaches the shear line and is picked. Picking a lock is simply a matter of lifting each binding pin until every pin has been raised to the right height and the plug turns as if there was a key. Single Pin Picking vs. Raking. Lifting one pin at a time is known as “Single Pin Picking”. Single pin picking is probably the best technique to use to learn lock picking because it teaches you to feel exactly what’s happening inside a lock and there will be times when that skill will be the difference between opening or not opening a difficult lock. 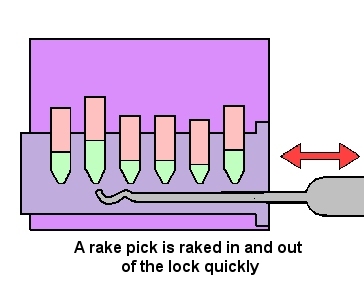 However, in many cases there are faster and easier ways to pick a lock than single pin picking and a technique known as “raking” is one of those ways. Raking is usually done with picks made for that purpose called rake picks although raking can be done with just about any type of pick. Raking is done by applying a turning force with your tension wrench just like in single pin picking and quickly sliding a rake pick in and out of the lock very quickly. A rake pick has a wavy or bumpy edge and as it is raked back and forth across the lock pins, the pins will ride up and down on the waves of the pick profile. Raking causes all the pins in a lock to bounce up and down and in many cases the pins will all end up at the shear line after a few seconds of raking. Even when raking won’t work to open a lock, it can often set several pins at the shear line leaving only a small number of pins to be single pin picked. Most of the time, raking a lock will result in a faster entry. Another useful picking technique similar to raking is jiggling. Jiggling is often done using picks called profile picks which are made to roughly approximate several different common key shapes. Rake picks can also often be used effectively as jiggler picks. To jiggle a lock, insert the pick into the key way (while applying a turning force with a tension wrench) and rock the pick handle up and down while sliding the pick slowly in and out of the lock. 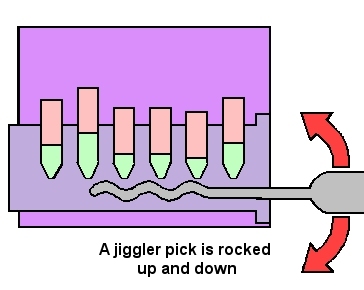 The jiggling action of the pick raises the pins up and down and if the proper pick is chosen eventually all the pins will be picked to the shear line. If you’ve chosen to purchase the Ultimate Challenge or Ultimate Adversary versions of our practice locks, it will include an assortment of security pins. Today, many lock manufacturers use these security pins to make their locks resistant to picking. Special security pins are designed to get stuck between the cylinder plug and housing if they are lifted while a turning force is being applied to the plug. A pick resistant lock may have only one security pin or could have several. Most manufacturers vary the number and position of these pins. When picking a pick resistant lock, the spool pins will false set at the shear line. 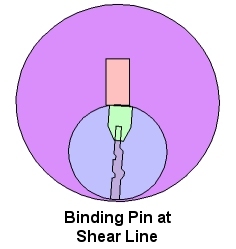 Once all the pins are set at the shear line, the cylinder will turn several degrees and stop as shown in the drawing below. This is known as the false set position. The easiest way to learn to overcome security pins is to pin your cylinder with 2 or 3 regular pin stacks and one stack with a security pin. 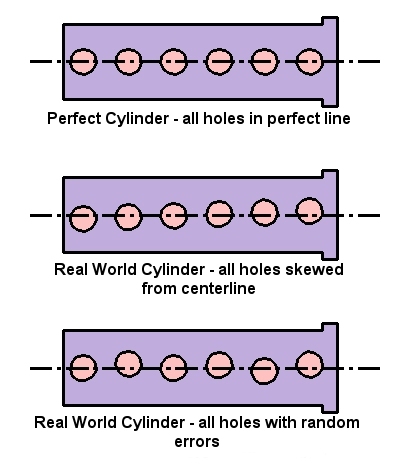 Pick this cylinder until you are in the false set condition shown above. The most common method of picking spool pins is to single pin pick the lock. With the lock in the false set condition, put upward pressure on each pin while using a very, very light turning force. You will be able to tell the difference between regular pins and security pins because regular pins that are set at the shear line will feel very rigid because they will stop against the cylinder housing. Security pins on the other hand will tend to force the plug to rotate back toward the locked position when they are lifted. Assuming all regular pin stacks are picked to the shear line and only your spool pin is keeping you from turning the cylinder, apply a very light turning force and lift the pin stack with the security pin. Let the plug rotate backward toward the locked position. At some point, the spool pin will break free and be lifted up to the real shear line. If you are lucky, the plug will then rotate and the lock will be opened. However, many times when the plug turns back toward the locked position far enough to let the security pin move, a few of the regular pin stacks may fall back into the plug. This is not really a problem because as long as you maintain light tension, the spool pin will stay where it is in the picked position and you can single pin pick the stacks that fell to open the lock. After you have learned how to pick locks with one spool pin, try two and then three until you can open the lock with spool pins in all 6 positions. With spool pins in more than one position, first pick the lock to the false set condition. Then raise each spool pin while allowing the cylinder to rotate back toward the locked position. 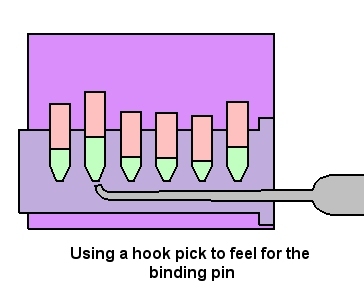 As you do this, some of the picked pin stacks may fall into the plug. Picking pick resistant cylinders often requires picking the same pin stacks over and over to the shear line as they fall with each spool pin that is picked. Patience and practice are required to master pick resistant locks. Although single pin picking is the technique most often used to pick security pins, some skilled lock pickers prefer to rake open locks with security pins. This can sometimes be done if very light tension is used. Whether you single pin pick or rake spool pins, the secret to overcoming pick resistant locks is light tension and lots of practice.